Austin Resource Recovery provides services designed to transform waste into resources and keep our community clean. Austin Resource Recovery provides curbside collection services for single-family homes and multifamily properties with four units or fewer. Multifamily units with five or more units must use a private hauler. Yard trimmings are collected weekly on the same day as trash. 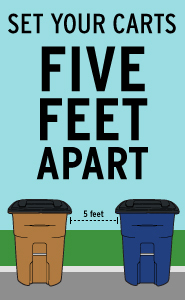 Curbside Composting is collected weekly on the same day as trash. Recycling is collected every other week. 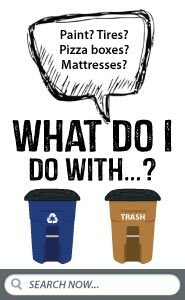 Clothing and housewares are collected every other week on the same day as recycling. Large brush is collected twice per year. Bulk items are collected twice per year. Use My Schedule to get a personalized collection calendar for all residential curbside services. You can add your schedule to Google, iCal or Outlook, or you can print it. You can also sign up for text, email or phone call reminders and alerts. Place carts at the curb by 6:30 a.m. Ensure your carts are at least 5-feet apart and away from cars, mailboxes, trees and overhead wires. Learn why. If you have clothing and housewares to recycle, put your green Simple Recycling bag next to the blue cart. Your collection day slides to one day later if it falls on New Year's Day, Thanksgiving Day or Christmas Day (or if it falls after these days in the same week). Use My Schedule to see your holiday slide schedules.